I'm really dangerous now - my box of parts arrived and I started working on my fuel leak. Here is the original thread on my situation if anyone cares to review - 606 leaking diesel again. Basically I was positive that my leak was coming from the gasket where the fuel pump mounts to the injection pump. That's where the wetness started. Everything above that was dry. MBDOC mentioned in a message that if the leak was coming form that gasket that it would be black engine oil not clear diesel fuel. I didn't comprehend that, but once I took the fuel pump off, I understood. 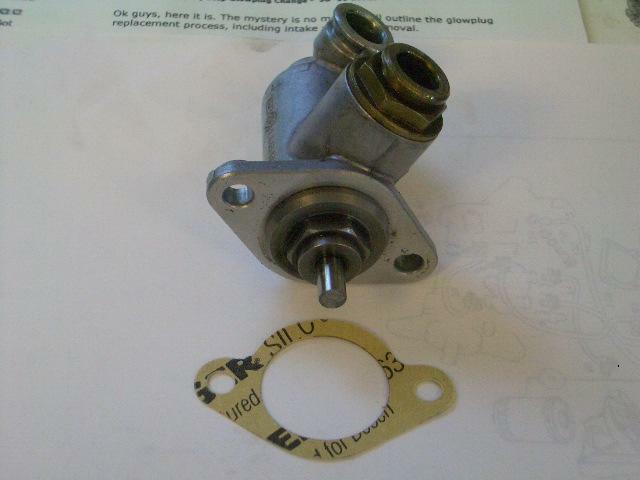 This fuel pump is very similar to the fuel pump on my ponton that I have removed a number of times and even rebuilt. There is a small cam/lobe from the engine that pushes the rod on the fuel pump creating a suction/vacuum that moves the fuel. The fuel pump has two separate compartments. 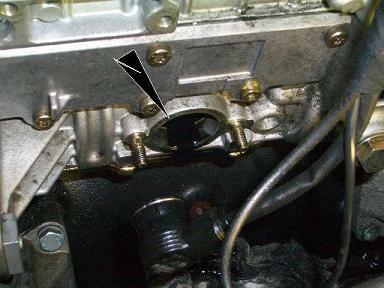 The compartment mounted against the injection pump is bathed in engine oil. The body of the fuel pump is sealed off from that compartment and has two fuel lines connected to it. See the photos below to see what I'm talking about. The first photo shows where the fuel pump is mounted and you can see the black engine oil in the mounting hole. The other two photos show that the fuel pump is sealed between the fuel side and the engine side. I had planned to replace the O rings, spring and valve in the fuel pump, but since it is a sealed unit and seems to be functioning properly when I depress the rod, I'm leaving well enough alone there. In addition to fixing my leaking fuel pump gasket which now appears to not be the problem, I also had plans to replace all the O rings with viton and replace all the fuel lines. Today I replaced the fuel shut off O ring, the fuel pump gasket, the prefilter O ring and all of the new fuel line O rings. Tomorrow I hope to tackle the delivery valve O rings. Hope this helps someone not make extra work for himself. I was kind of wondering why it seemed like I was the only one who seemed to have a leak at that gasket. I still haven't found the real leak, but I'm replacing everything, so that ought to fix it. One of those jobs that you should do 'while you're in there' so to speak. Ben - I'd say that if you aren't seeing black engine oil leaking from the fuel pump, then leave it alone. Lesson learned. So the viton o-rings I sent you all worked just fine? Let me know how the rest of them go. 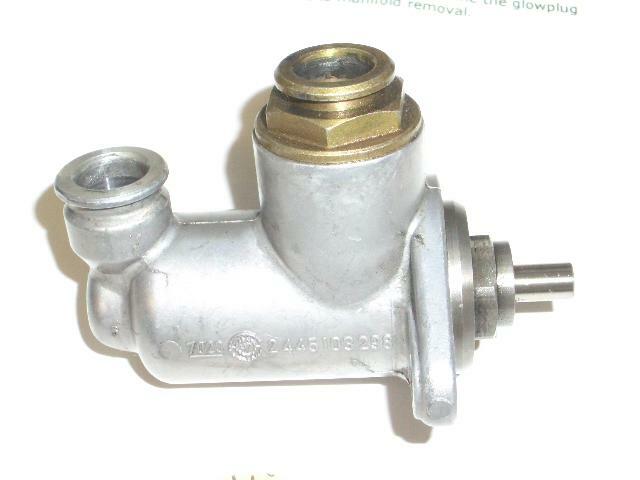 You have a 606 - have you taken the plastic cover off the top of the engine and checked the injector fuel return lines. If they are old they could be weeping fuel which puddles in the injector recess. Good ol Len, charting the uncharted for the rest of us. Glad you figured the fuel pump mystery out. Hopefully one of the two fuel lines that connect to it were the real culprit and the new viton o-rings will resolve it. JADAVIS - I gave you all the sizes. They ARE correct. You're a worry wart. Jim - so far so good on the O rings. I think there was one too many of the 2.5 x 8mm ones for the fuel lines unless there is somewhere else one of them goes that I haven't come to yet. Used the one on the prefilter and the shut off valve and they were fine. Terry - I obviously missed the source of the leak and I thought I checked very closely. From the location of the wetness, I'm moving the leak from the gasket now to one of those two fuel lines you suggest. I don't see your torque wrench in the picture. Please tell us that you are planning to use a good one and that you promise not torque steel bolts into aluminum threads more than 10nm. I want to follow your progress and don't want to hear that you overtightened something. Your fuel leak will pale next to a stripped bolt hole. Seriously. As I said earlier, I've just started to remove the manifold. And believe it or not, I have two bolts that won't come off. They actually unscrew a good two full turns, but really jam after that ! They don't look cross threaded though, but I've left them there for tonight. I found a badly leaking return line underneath the black "valve" cover. I had already planned to change them all. I expect DHL to drop the parts in tomorrow. And yes, that big O-ring for EGR is in the order. I will wait until this fall to do the steel fuel lines, glow plugs, pressure delivery valve seals and possibly injectors. Removing the intake wouldn't be that bad of a job after all. It's just the previous mechanic that worked on it that screwed up by overtightenning these two screws. So Connerm, you couldn't say better! Would it be a good idea to use never cease? And by the way, what is the cure for a stripped bolt hole? I recal about heli-coil or something like that... would that be the way to go? Big Ben - The intake manifold cap bolts are to be torqued to 20NM starting from the center and moving to left and right thirds. Anti sieze is a lubricant, like putting oil or grease on a bolt and can result in less resistance and increased torque when reinstalled. MB didnt use it, I wouldnt (and didnt) either. Go hit the tight ones with PB Blaster or WD40 now and let them sit overnight then try again. I got one out after hammering on it when it was fully tightenned. The other one came out about 4/5th, but the bold head snapped right off (broke), so I'm left with a stud in place... see what I mean? I may just put a nut on the sucker. And I will have a torque wrench on hand when I finish the job! Got all the parts delivered. Bought the parts from MB Canada. The o-rings on the hose fittings: are they Viton automatically these days? They are black, just like "regular" o-rings. Put two nuts on it and remove using the jam nut.